The President just went to Stonehenge. Why shouldn’t we go too? 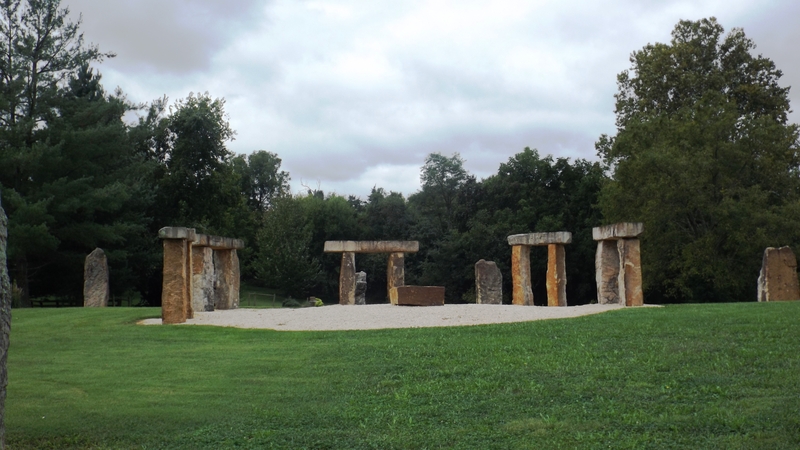 We skipped out on Munfordville’s Civil War Days parade to make a short side trip to Kentucky Stonehenge. 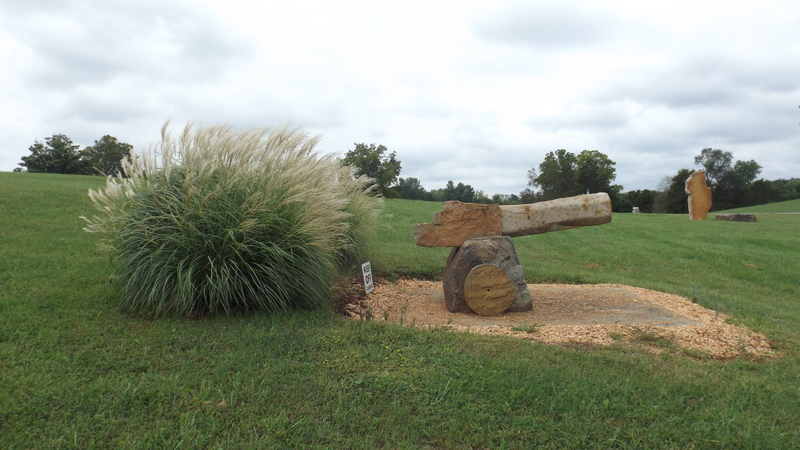 This ‘henge is basically a fellow’s back and front yard, but since his house sits on maybe fifteen acres, they’s real big back and front yards. And it is an improved Stonehenge (modern engineering and astromony, don’t you know) built to scale, a third as large as the real ‘henge but still immense. And so far, nobody’s buried there. But it is nonetheless some seriously impressive outdoor sculpture. A local rock hound name of Chester Fryer built this thing. 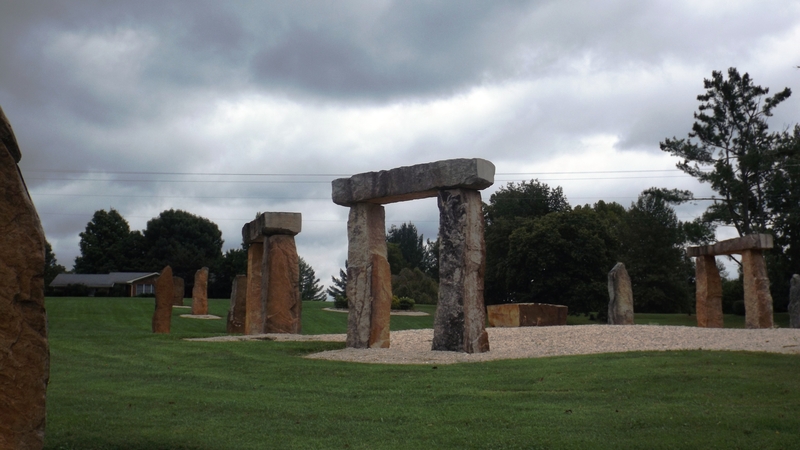 Mention “Kentucky Stonehenge” to the local tourism office and you’re gonna get some smirks. But they will tell you how to get there. The Google does not know how Chester came by the dinero to buy such a large and beautiful site, nor how he could finance moving and erecting these monstrously heavy stones. And then there’s the groundskeeping and landscaping – all done immaculately – neither of which seems likely to be cheap, even in a small town. Somehow Chester Fryer found the inspiration to build this and a couple of other highly interesting rock and horticulture gardens on the grounds of his lovely yet sensible home. Cannon Hill protects Chester’s home from any attack from the east. The Hill is sited upon a typical Civil War landscape. There is a broad meadow which the assaulting force must cross with absolutely no cover nor concealment, then a hill to climb with artillery atop the hill waiting patiently for the opportunity to do their grisly business. Minus the rock wall at the top of the hill and a picket fence to knock down or climb over halfway up, this is Cemetery Ridge at Gettysburg in miniature. If you’ve had any infantry training it’s clear that the attackers will suffer horrible casualties. And you can only wonder where those who made the assault found the courage to confront lead and explosives with flesh. 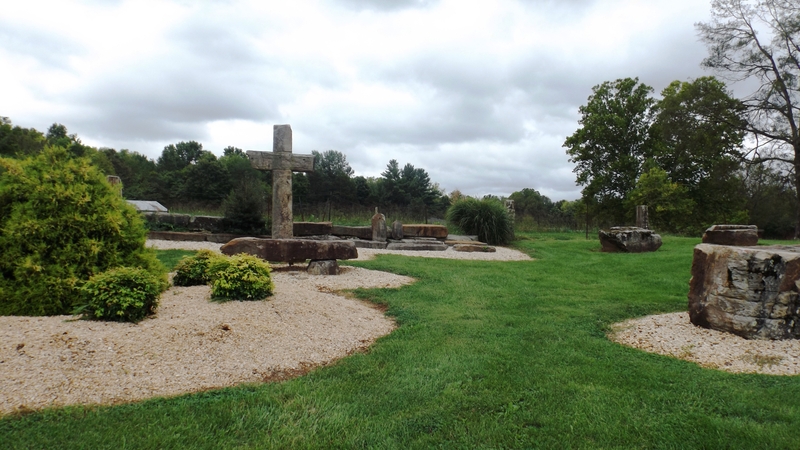 Mr. Fryer also built an artist’s impression of The Garden of Gethsemane. If you weren’t paying attention in Sunday School, that’s where Christ reflected on his earthly fate, was betrayed by Judas, and hauled off to face Pontius Pilate. Chester did a fine job of capturing the spirit of place and eventual end result. We are more spiritual than religious, but nonetheless found it moving. 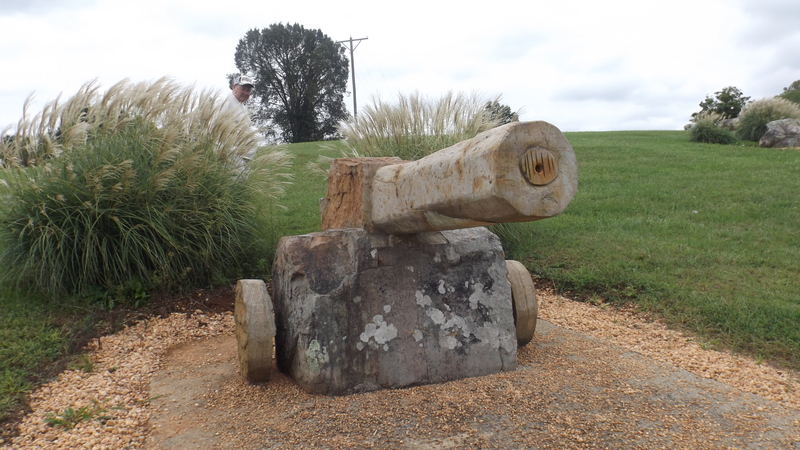 All of this is located on Lynn Avenue in Munfordville, Kentucky. 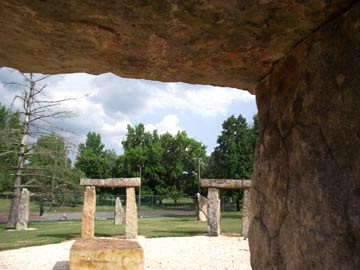 It is no more than a mile off I-65, and despite the comments of some, we think it’s well worth a visit. It’s a cool place even if it feels just a little bit creepy prowling around someone’s house … maybe it would have been less creepy had we not worn those Nixon masks? Thanks for the great tip! Will have to check it out! Looks pretty neat! Glad you liked it. Bardstown has a bourbon festival, and there’s an Oktoberfest in Louisville (we haven’t been there) which are also pretty good. Alas, most are on Saturdays, but still … many are worth a visit.